Dedicated circuits – Are your appliances running safely? Or do you trip a breaker each morning when you make your toast, putting added strain on other kitchen appliances? If this is a frequent occurrence in your home, your appliances may not be wired properly. Dedicated circuits are required by the National Electrical Code for major electrical appliances such as refrigerators, stoves, washers, dryers, space heaters, and more. They ensure enough power is available so that appliances can operate safely, without overloading the system. Plano Texas Handyman can add a dedicated circuit for any new appliance, tool, technology device, or electrical apparatuses to your home call us at 214-507-3415 or visit or website for more information. For mid-range items, like refrigerators, dishwashers, heavy power tools, microwave ovens, hair dryers and toasters and other similar appliances. For heavy duty appliances like dryers, electric ovens, electric cook-tops. 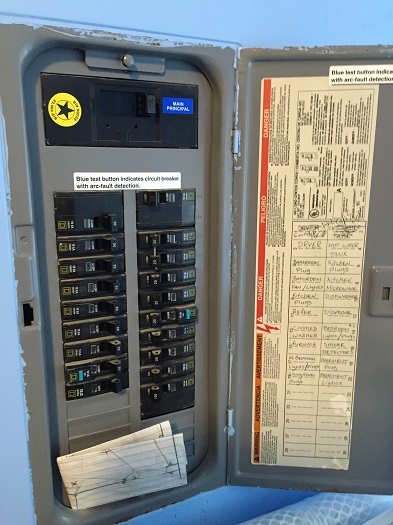 These breakers typically offer “double pole” protection to prevent the circuit from drawing too much power, possibly resulting in a fire. Why are dedicated circuits important for my home? Dedicated circuits protect your appliances, your family, and your home. Appliances without a seperated circuit may draw more current than the circuit can handle, tripping breakers, blowing fuses, and overheating wire insulation causing breakdown and the possibility of electrical fires. Appliances that are wired to a dedicated circuit with incorrect wire size and insufficient amperage for their needs may get overheated possibly resulting in a fire. How do I know if I need a dedicated circuit installed? The National Electrical Code requires that every fixed appliance be served by a separate, seperate circuit, not shared with any other appliance. Breakers that are constantly tripping are a good indication of appliances in need of a seperate circuit. If it has a motor, it typically requires its own circuit. Plano Texas Handyman can add a circuit for any new appliance, tool, technology device, or electrical apparatuses to your home call us at 214-507-3415 or visit or website for more information.